One of the ongoing trends with Symposium clients is that their operations tend to grow. Installations that start out dispatching for one or two departments will, over the course of several years, often end up dispatching several more. To date, this has scaled up to individual installations dispatching well over a hundred departments, and we like to think this speaks well about the strength of the solutions we offer. One such client is Barrie Fire and Emergency Services, which now dispatches nearly triple the number of departments that they started with when they initially signed on with Symposium. Located on Lake Simcoe in Ontario and with a population of over 150,000, the City of Barrie is a major regional hub for surrounding Simcoe County and beyond. When Barrie Fire Department initially became a client of Symposium the installation was considerable, covering both the city and seven surrounding departments that, together, provided protection for a population of 250,000. Now, several years later, those numbers have grown considerably. As of this year, Barrie Fire and Emergency Services provides comprehensive fire dispatch for twenty departments, serving roughly 425,000 full-time residents in communities throughout central Ontario. Sue Dawson – originally Manager of Dispatch and Communications and now Deputy Chief of Communications and Business Services – has had a major role in overseeing this growth. Two key features that helped support this growth is that the system is both “fire-centric” and multi-agency, designed from the ground up to reflect the unique and complex dispatch procedures of fire departments, to support customized capabilities for each department using the system, and to offer unlimited scalability in the number of departments and calls the system can handle. 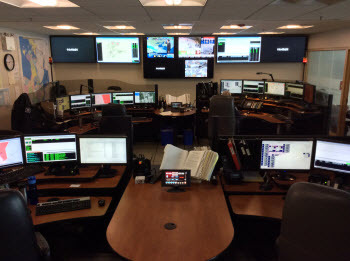 Another factor in the Barrie fire dispatch’s continuing growth are the technologies that Symposium has continued to introduce that extend the capabilities of the system, which are lightweight, easy to adopt, and economical for participating departments. One example of this is the EM Live web-based incident monitoring system. Available via mobile device, it gives responding personnel the location, map, details of the call, location of responding units, and even access to RMS info, all in real-time from the CAD. If you’d like to find out more about the growth and success of Barrie or other Symposium clients, please feel free to contact us via phone, or at info@symposium911.com.